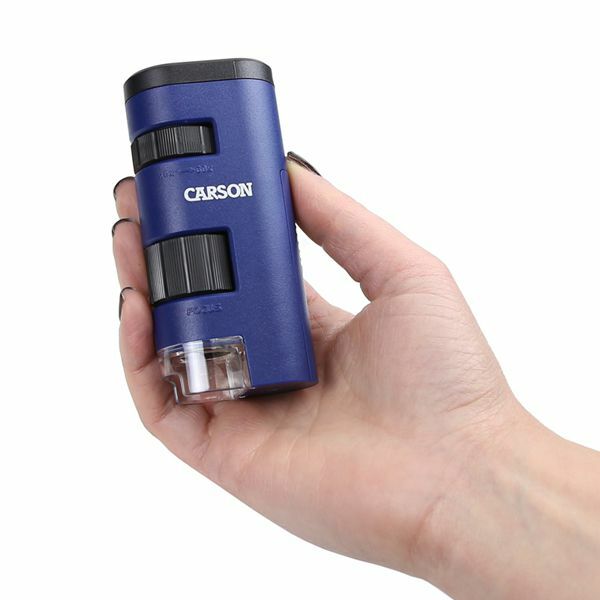 Carson MP-250 MicroFlip, 100x - 250x LED and UV Lighted Pocket Microscope with Flip Down Slide Base & Smartphone Adapter Clip - New York Microscope Co.Carson MP-250 MicroFlip, 100x - 250x LED and UV Lighted Pocket Microscope with Flip Down Slide Base & Smartphone Adapter Clip - New York Microscope Co. The MicroFlip™ MP-250 is an extremely powerful LED lighted pocket microscope that contains a unique flip-down slide base with an aspheric lens system for ultra precise image quality. The high power magnification ranges from 100x-250x power. The MicroFlip™ also contains a built-in UV flashlight that is perfect for detecting counterfeit currency, nectar mapping and so much more. The MicroFlip™ comes included with a smartphone digiscoping clip, 1 starter slide with cover slip and a wrist strap for convenient portability. Use the smartphone digiscoping clip to take pictures and record video of your subject matter using the built-in camera application on your smartphone. Then, share your images and videos on social media or email/text them to family, co-workers and friends. The smartphone digiscoping clip will work with most smartphone models in the marketplace including iPhone, Samsung, HTC, LG and more. Thicker cases like Otterbox style cases may need to be removed before attaching the digiscoping clip. The MicroFlip™ is powered by 1 AA battery (not included). It is a great, cost effective educational field microscope for multiple hobbies, tasks, learning and exploration. Dimensions 2.4" x 1.25" x 4.3"